Of late, the global unmanned underwater vehicles market has been observing a tremendous growth in their valuation. With the significant rise in the oil and gas industry, the deep-water offshore activities for the production of oil and gas and the number of offshore constructions have increased substantially, which is influencing the uptake rate of unmanned underwater vehicles across the world. In addition, the surging threats over maritime security is expected to boost the demand for these vehicles over the next few years, reflecting positively on this market. By 2017, the global market for unmanned underwater vehicles is anticipated to reach a value of US$2.4 bn. The opportunity in this market is anticipated further rise at a healthy CAGR of 11.80% over the period from 2017 to 2022 and increase to US$4.26 bn by the end of 2022. The defense sector, scientific research, and commercial exploration are the key application areas for unmanned underwater vehicles across the world. Currently, the demand for these vehicles is relatively greater in the commercial exploration segment and the trend is projected to continue over the forthcoming years on the grounds of the considerable rise in various activities related to commercial exploration, such as seabed mapping, surveys, pipeline inspection, and offshore drilling. Autonomous underwater vehicles (AUVs) and remotely operated vehicles (ROVs) have gained a reputation as the key unmanned underwater vehicles across the world. Among the two, ROVs have been the leading contributors to this market and are anticipated to remain so in the near future due to their increasing demand for ultra-deep water drilling. Mechanical systems, electrical systems, and hybrid systems are the most preferred propulsion systems utilized in unmanned underwater vehicles. In terms of the geography, the worldwide market for unmanned underwater vehicles reports its reach across Asia Pacific excluding Japan (APEJ), North America, Europe, the Middle East and Africa (MEA), Latin America, and Japan. With early adoption of technology, North America has been leading the overall market for the last few years. This regional market is estimated to proliferate at a CAGR of 11.40% between 2017 and 2022, maintaining its dominance over the global market in the near future. The continual increase in the oil and gas exploration activities is likely to boost the North America market for unmanned underwater vehicles substantially over the next few years. 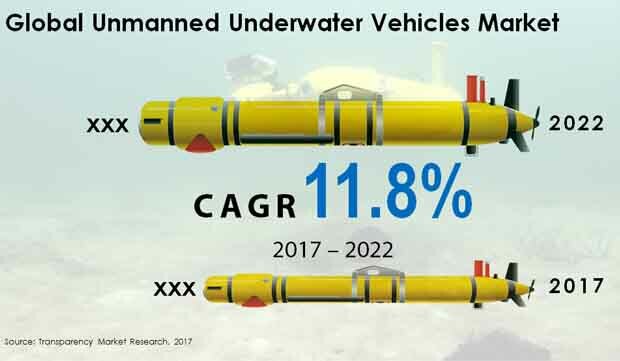 Europe and Asia Pacific excluding Japan are also witnessing significant growth in their respective markets for unmanned underwater vehicles, thanks to the increasing exploration activities in these regions. However, it is the Middle East and Africa that is expected to offer the most promising opportunities for the growth of the overall market in the near future. The ongoing expansion in the oil and gas industry and the increase in the activities related to the discovery of new oil and gas exploration fields between the Gulf of Mexico and Africa are expected to propel the Middle East and Africa market for unmanned underwater vehicles in the years to come. The global market for unmanned underwater vehicles demonstrates a highly competitive business landscape. Some of the key vendors of unmanned underwater vehicles across the world are Subsea 7, Thales SA, Teledyne Gavia ehf, Boeing Co., Kongsberg Maritime AS, Oceaneering International Inc., General Dynamics Corp., Saab AB, Atlas Elektronik GMBH, and Lockheed Martin Corp.
With the increasing need for fuel energy, the worldwide oil and gas industry is witnessing a substantial rise, which, subsequently, is reflecting greatly on the global market for unmanned underwater vehicles market. The recent increase in exploration activities is fueling the demand for unmanned underwater vehicles remarkably across the world. This research report on the global unmanned underwater vehicles market presents a thorough analysis of the current scenario and the future status of this market. It consists of an elaborate executive summary, including a snapshot of the market that offers information regarding the performance of various market segments, bifurcated on the basis of the products, applications, propulsion systems, and the geography. The report includes a market overview section, in which a detailed qualitative assessment of the driving forces, limiting factors, opportunities, and challenges has been provided. This section also offers an assessment of the market attractiveness in terms of the geographical segmentation and the market share analysis, carried out on the basis of the key players, thus offering a thorough evaluation of the entire competitive scenario prevalent in this market. The market size, growth rate, availability of raw materials, profit margin, strength of the impact, competitive landscape, technology used, and various legal and environmental factors have also been evaluated here in a bid to determine the general attractiveness of this market. Further, an exhaustive analysis of the entire value chain for each of the segments have been carried out in this report. The value chain analysis offers an in-depth information about the value addition at every stage. In this research report, the global unmanned underwater vehicles market has been evaluated on a number of parameters, such as the availability of products, their cost efficiency, and the preference for technological systems among end users. The market is broadly evaluated on the basis of the product, propulsion system, application, and its regional reach. Based on the product, the market has been classified into autonomous underwater vehicles (AUVs) and remotely operated vehicles (ROVs). By application, the market has been categorized into the defense sector, scientific research, and commercial exploration. On the basis of the propulsion system, the market has been segmented into mechanical systems, electrical systems, and hybrid systems. In terms of the geography, the worldwide market for unmanned underwater vehicles has been bifurcated into six main regions: North America (the U.S. and Canada), Latin America (Brazil, Argentina, and Mexico), Europe (the U.K., Italy, France, Germany, Spain, and Nordic countries), Asia Pacific excluding Japan (India, China, South Korea, Indonesia, Australia, and Singapore), the Middle East and Africa (South Africa, Turkey, Israel, and GCC countries), and Japan. The market size and the prediction for each of these segments have been presented in this research report for the period from 2017 to 2022, along with their respective cumulative average growth rates for the period of the forecast. The research report also reviews the profiles of the key players in the global market for unmanned underwater vehicles on the basis of various attributes, such as the overview of the company, its financial situation, product portfolio, the strategies adopted for business expansion, SWOT analysis, and the recent developments. The leading players reviewed in this market report are Subsea 7, Thales SA, Teledyne Gavia ehf, Boeing Co., Kongsberg Maritime AS, Oceaneering International Inc., General Dynamics Corp., Saab AB, Atlas Elektronik GMBH, and Lockheed Martin Corp.